TAMPA, Fla. -- With graduation day looming, Ryan Walsh received some news that removed a cloud of uncertainty from his immediate future. The Honors College history major’s name is being added to USF’s growing Fulbright roster after winning a Fulbright English Teaching Assistantship he will use in South Korea beginning this summer. “This is a time in my life when I’m young, energetic and eager to broaden my horizons, so I thought, ‘why not do it now?’” Walsh said. Always interested in global history, Walsh was struck early in life by how few opportunities Americans have to learn about parts of the world outside of the West, especially East Asia, a region filled with civilizations that have very long histories. He changed that situation around for himself when he began taking courses with the Confucius Institute, became an exchange student at Nankai University in Tianjin through USF Education Abroad, and while in China helped INTO University Partnerships market its USF programs to Chinese students and parents. Walsh now divides his work time between serving as Asia programs coordinator in the USF Education Abroad office and as assistant to the director of the USF Confucius Institute. It probably won’t take him long to get acclimated. This is his second opportunity to live abroad for a year and builds upon a previous introduction to Korean culture. “When I lived in China as a USF exchange student, a roommate and other international classmates from Korea introduced me to their language, cuisine, history and television dramas. As I was living in and learning about China, I knew in the back of my mind that I wanted to someday find the time to learn more about Korea,” he said. The first leg of the Fulbright program is a six-week in-country orientation that starts in July. Then he’ll be assigned to a secondary school, live with a South Korean family and promote intercultural exchange within his community for the academic year. Walsh finds the Fulbright teaching program is just what he needs at this point in his life and in synch with his professional interests in teaching and international education. 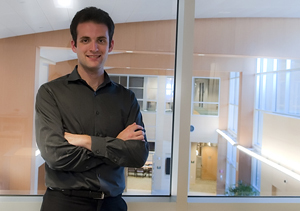 After returning from South Korea, Walsh plans to pursue graduate studies in history and continue with his research on early modern Europeans who wrote travelogues about East Asia.